Under the Clean Water Act, there are several categories (or levels) of protection available for surface waters (rivers and lakes). The highest level of protection comes from a designation as an Outstanding National Resource Water (ONRW). ONRW status means that no activity is permissable if it will result in lower water quality than already exists in the affected water. The availability of clean water will define the future of all communities in the Southwestern United States – not to mention the health of its residents. Currently, New Mexico and Arizona are consuming more water than the two states receive from precipitation each year. At the same time that the region is mining water from its aquifers at unsustainable levels, pollution, climate change, and population growth are adding pressures to the scant supplies of available clean water. With ever increasing thirst and diminishing supplies of available water, urban areas drive up the price of water, which in turn dries up farmland and places rural communities at risk. Rural communities of the Southwest are in the midst of a water crisis that will not be solved without proactive and visionary action by its residents. The Clean Water Act (CWA) is the piece of federal legislation that protects our waters from unregulated dumping and pollution. Recent Supreme Court decisions severely limiting the scope of the CWA and federal agency policies reacting to those decisions have put our state's waters at risk. Because of these decisions and policies, over 90% of New Mexico's waters are at risk of not receiving Clean Water Act Protections. Since passage of the Clean Water Act in 1972, we have made great progress in cleaning up New Mexico's waters. However, Supreme Court rulings in 2001 and 2006 have led polluters to argue that the law no longer protects numerous wetlands, streams, rivers, lakes, and other waters historically covered by the Act. In 2005, the NM Water Quality Control Commission, with extensive support from Amigos Bravos, revised the definition of "surface waters of the state" in order to counter the harmful impact of national decisions to curtail the CWA. 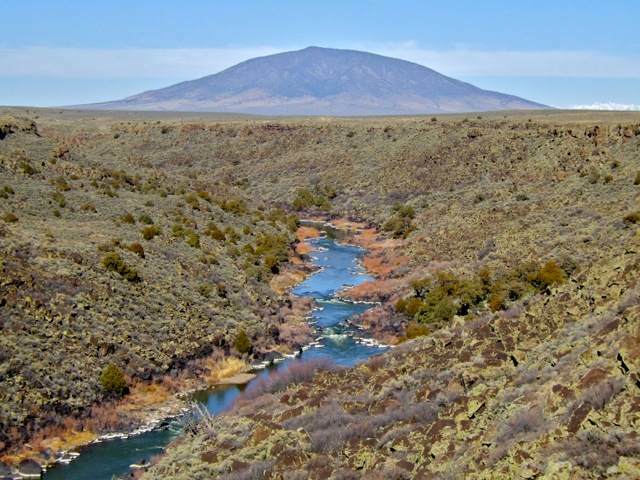 Although industry groups challenged this definition in court, the New Mexico State Court of Appeals upheld the State's right to protect all of New Mexico's waters, regardless of decisions made by the federal government. This was a wonderful accomplishment for New Mexico, but the threat now comes not only from on-going efforts in Congress to weaken the federal Environmental Protection Agency (EPA) and other agencies’ ability to protect our waters, but also from the Governor and the state Legislature, both of which have relentlessly pursued administrative actions and legislation (sometimes violating the state Constitution) to harass New Mexico Environment Department staff, stack important regulatory bodies with anti-environmental members, and weaken the ability of the state to actually regulate polluters. Each state is required under the federal Clean Water Act to develop a report that contains an assessment of water quality in the state and summarizes efforts to address water quality problems. This report is called the §303d/§305b Integrated Report. These reports present general information about the condition of water quality in the state as well as specific information about individual waterbodies and whether or not they are meeting water quality standards. To find out if your river or stream is meeting water quality standards go to the 303d list component of the report (sometimes the 303d list is also called the impaired waters list). 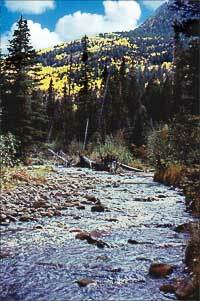 In New Mexico the most common pollution issues in rivers and streams are temperature (rivers and streams are too hot); nutrient/eutrophication (too many nutrients leading to crashes in dissolved oxygen); and E. coli. Rangeland grazing, natural sources, and loss of riparian habitat are the leading sources of pollution in New Mexico’s rivers and streams. 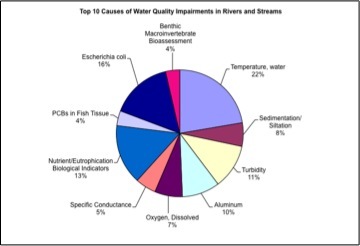 Mercury and PCBs in fish tissue and temperature are the most common pollution issues in lakes and reservoirs. A tmospheric deposition, contaminated sediments, natural sources and rangeland grazing are the leading sources of pollution in New Mexico’s lakes and reservoirs. 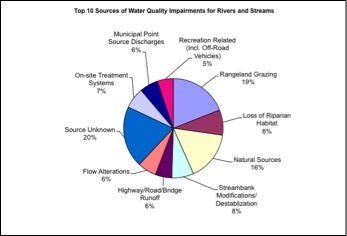 The two graphs below display the main sources and causes of water quality impairment in New Mexico. For more detailed information about the health of New Mexico’s waterbodies, see the §303d/§305b Integrated Report and Amigos Bravos’ Citizen Toolkit for Monitoring and Advocating for Clean Water in Arizona and New Mexico. Amigos Bravos continues to work on the national level to pass legislation that would restore protections guaranteed by the Clean Water Act for nearly 30 years before the Supreme Court changed the rules. We also work with allies in the state to mobilize during the legislative session to block all efforts to roll back state protections and have fought back aggressively (and won) in the state courts to reverse actions by the Governor and her agencies. The New York Times article of 3/1/10 on the Supreme Court decisions. The New Mexico fact sheet (324 KB pdf). The South West United States fact sheet (328 KB pdf). The highest level of protection for water under the Clean Water Act. The NMED 303D and 303B lists.